In Sarah Shun-lien Bynum’s “The Young Wife’s Tale,” the narrator asks, “But why should Eva think of those old stories? 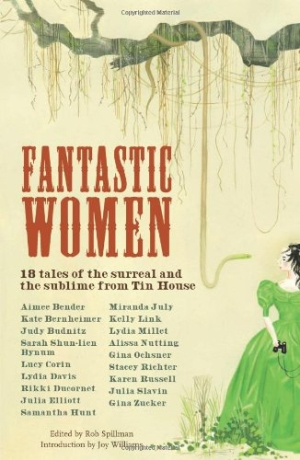 … Could enchantment take hold among the recycling bins, the sickly houseplants, the student-loan letters?” Indeed, it can, as enchantment in the ordinary is a theme of Fantastic Women: 18 Stories of the Surreal and the Sublime. Each tale illuminates familiarities to reveal them as bizarre and messy, proving that life isn’t as mundane as one often believes. The authors in this collection are masters of the surreal, the sublime, and the downright strange, and each invites the reader to look closer at the surrounding world. In “The Entire Predicament,” Lucy Corin’s narrator shows that even oxygen hums with life: “Bright air moves like a thousand singing bees as I breathe.” And Julia Elliot illustrates the adolescence of plants in “The Wilds,” as her narrator says, “We were deep into summer and you could see the vines moving, winding around branches, sprouting bumps and barnacles and woody boils that would fester until they could stand it no more, then break out into red and purple.” This slanted view makes the stories vivid—and takes the concept of “normal” for a spin. More than just pretty pictures, these images shine insight into trials like love and loss. In Gina Ochsner’s “Song of the Selkie,” the narrator says of the lighthouse attendant, “From rib to rib his heart is a melon falling rung by rung down a long ladder.” Not immune to longing, the characters also can’t escape the sting inflicted by loved ones. The narrator in Karen Russell’s “The Seagull Army Descends on Strong Beach” says of a character, “[He] could wrench a secret from the depths of your chest and dangle it in front of you, revealing it to be nothing but a common, mud-colored fish.” Even in alternate universes, life has a way of hitting where it hurts. Whether dealing with a shadow who becomes a flesh-and-blood twin, as in Kelly Link’s “Light,” or turning into a deer each night, as in Samantha Hunt’s “Beast,” these characters are no more subjected to nor exempt from the strangeness of existence than those in “reality”—but the individual might have more control than he knows. In Russell’s story, the narrator says, “If fate was just a disintegrating blanket … then Nal didn’t see why he couldn’t also find a loose thread, and pull.” This book will speak to anyone who’s ever yearned to pull that thread.